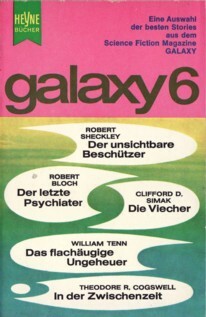 Selection of stories from the magazine "Galaxy". The last page of "Die Welt der Illusionen" is not numbered. Price from surrounding Heyne publications. Atelier Heinrichs & Bachmann is credited for the cover on the copyright page ("Umschlag: Atelier Heinrichs & Bachmann"). Month of publication from the editor's statement in Terra 467.